Christian Clothing-Does God Care What You Wear? This is a powerful message from Larry Stockstill of Bethany World Prayer Center. He was the guest speaker at Gateway Church. If you have ever wondered about the seven candlesticks mentioned in the Bible, Pastor Stockstill gives an incredible teaching that blessed me and if you are seeking wisdom and knowledge, in this area, this will bless you. This link may give you the most recent messages at Gateway, so if Pastor Stockstill’s message is not showing up you may need to search for it, it will be worth your trouble. usually the best of the best. It would be like having Tiger Woods tell you how to hit a driver and then show you videos. Are you then going to be able to hit the ball like Tiger? No, not even if he takes you outside and teaches you everything he knows, you still will not hit the ball like Tiger. Tiger has a gift, and his gift makes things easy for him that are harder for you to do. I’ll bet you struggled to witness like the evangelist also. Have you ever thought, “maybe that is not my gift”. Have you ever asked the question, “What about us average non-gifted believers”? What are we to do? Since becoming a Christian over 16 years ago I have been told repeatedly, “you need to fulfill the Great Commission”. How many times have you gone door to door? I have never read in the Bible where Jesus went door to door. (So why do we?) His fame, love or reputation brought the people to Him. Feeling a little frustrated and maybe even a little guilty, I prayed for help to be a better witness. My goal was not to save the world, I wanted to be able to talk to friends and family about Jesus. God gave me an idea over 6 years ago and it has changed my witnessing life forever. This idea was so simple, even I could do it. The first time I tried this simple idea, two people asked me about Jesus. Over the last 5 years I have told hundreds of people about Jesus and I still do not consider myself an “evangelist”. If you have ever struggled with witnessing, we have discovered an amazing tool… your clothes. Clothes were invented by God to cover sin, (Gen 3:21)and God gave us a logo to use, to help tell people about Jesus. Here is the best part…you don’t have to say a word until someone asks you a question. We have coined the phase Effortless Evangelism. Jesus said, “My yoke is easy and My burden is light”. So with that scripture in mind, we developed Wear Christian Clothing, a company created to empower/help the body of Christ fulfill the Great Commision. Because I am in Louisiana and have first hand experience with Mardi Gras, I thought I would share with you my opinion and observations on the Bail-out/Stimulus package. It seems “throw me something Mister” is not only echoing on city streets in Louisiana, I here many mayors and governors screaming something very similar in Washington. First, I must confess, I have not been to a parade since a grown man ran over my 4 year old daughter many years ago for a plastic cup. That’s right, he weighted about 200lbs to maybe 25lbs. Not much of a match for my daughter ( and it took everything I had and a little help from a friend not to “level” the idiot/playing field.) He was obviously thirsty, his beer was gone and he wanted a new cup to pour up the next one. What is going on in Washington is eerily similar to my experience. Governors, mayors, lobbists and insiders (people who know how politics are played) are lining up along side average citizens (who have heard there are “free goodies”) to catch what is coming out of Washington. Now let’s talk about the “throws”. (This is where there is a distinct contrast)Each float is responsible for supplying the “free throws”. 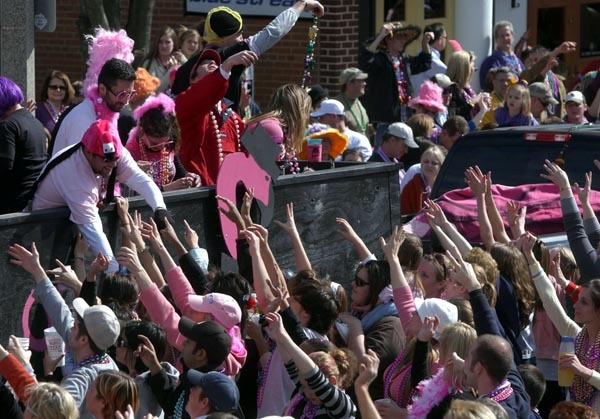 In a Mardi Gras parade, if you ride on the float, you have to buy the throws. The good news here is, if you buy them, you throw them. The government, like the floats, have just finished gathering their “throws”. The government did not buy their throws, they took them from people that probably did not vote for them. That’s right, most producers probably voted for smaller government and lower taxes. They lost, so the winning side has decided to reach into the future and grab as much money from the producers as possible and start throwing to the people that got them elected. You cannot legislate the poor into freedom by legislating the wealthy out of freedom. What one person receives without working for, another person must work for without receiving. The government cannot give to anybody anything that the government does not first take from somebody else. When half of the people get the idea that they do not have to work because the other half is going to take care of them, and when the other half gets the idea that it does no good to work because somebody else is going to get what they work for, that my dear friends, is about the end of any nation. You cannot multiply wealth by dividing it. We are learning a painful lesson, not all politicians are the same. Some actually want to change America into something the Constitution never intended it to be, an Oligarchy, where only a few chosen ones rule over the masses. The people standing on the parade route come from anywhere, it costs them nothing to stand there and scream. Many parade goers partake in adult beverages while they wait, usually from daybreak until the parade starts let’s say 4:00 or 5:00pm. This sets the stage for real “excitement” when the parade finally starts. Imagine if you will, the electricity, when alcohol and “friendly” competition for throws come together. The little ones don’t stand a chance if you get a “real man” in your area. A similar free-for-all grab is going on today in America, but it did not start with the Stimulus Package. No, the grown-ups in this parade have been taking money for a long time and like the drunk that will knock a little girl down for a plastic cup, these men (and women) are drunk on power and money and they do not care who or what they knock down. Read the Housing market, Stock market, Banking system, Global economy etc. everyone in this parade will do anything to get money and now their actions have upset the masses. So to calm the masses down they have to throw a little money their way. Enter the great stimulus package, our new government “throws” the money to the people that got them in power. You can’t pay your bills? Here is a little something. You don’t want to work? Catch! The line goes on and on and on. It did not happen over night. It didn’t even happen since the last election. The church has bowed the knee to government. We now look to the government to solve our problems. You can’t pay your bills? You are sick and have no insurance? You are old and have no retirement? Call the government, we will pray you get the right department. The church must now be reminded there is no recession in the Kingdom of God. Jesus became poor so that we might become rich. God gave us the power to create wealth. There is no sickness in the Kingdom of God. By His stripes you were healed. This list also goes on and on but you are required to walk by faith and not by sight. Remember the just shall live by faith and it is impossible to please God without faith. 1 John 5:4 speaks to the power to overcome dependence on the world or in our example, the government. For whatever is born of God overcomes the world. And this is the victory that has overcome the world- our faith. How do we get the faith we need to get through? Faith comes by hearing and hearing by the word of God. The church is at a crossroads, we can scream to the government to “throw me something Mister”, or we can believe God’s word is true. Plant His incorruptible seed deep in your heart and start watering it with His word. It is time to make a choice, I chose to follow Jesus. I pray you will do the same.